At a press conference this afternoon from Marlins Park, new manager Ozzie Guillen apologized over and over again for complimentary remarks that he made to a Time Magazine reporter about the brutal Cuban dictator Fidel Castro in an article that ran yesterday. This is far from the first time that Ozzie Guillen has made controversial remarks, but telling the Times Magazine reporter that he “loved” and “respected” a leader who hurt so many people and took away basic rights from the people of Cuba, was way out of bounds and alienated a major portion of the population in South Florida. Little Havana is one such neighborhood, home to many Cuban immigrant residents, where people there were less than thrilled with the statements that Guillen, a former player of Venezuelan descent, made to this reporter. Today, as many people do when they realize they’ve made a huge mistake, Guillen backtracked from his comments. While Guillen said that he took responsibility for the uproar and that he was left feeling sad and embarrassed, he did try to play off some of the fervor as a misinterpretation of what he said by the reporter. Guillen also admitted that he was his stream of consciousness was in his native Spanish and that it didn’t come out right when articulated in English. In other words he was making excuses. Fidel Castro's dictatorship negatively impacted many lives of Cuban nationals. In Guillen’s own words, as printed in Time Magazine, “I love Fidel Castro. 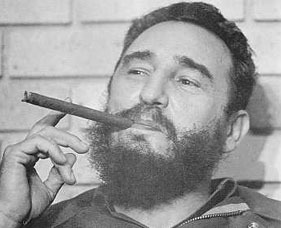 I respect Fidel Castro. You know why? A lot of people have wanted to kill Fidel Castro for the last 60 years, but that [expletive] is still there.” Well guess what Ozzie, with ignorant comments like that you may not even make it through your first season as manager of the new-look Marlins. You may not even make it out of Miami with your own life. For everyone else, take this as a lesson to watch what you say whether it is in your personal or professional life, as not having a filter can have serious consequences. The old saying goes “sticks and stones may break my bones, but words will never hurt me” may ring true as a child, but as an adult what you say matters and can cost you a job, your freedom, or even your life. Ozzie Guillen is lucky that this lapse in judgment is only costing him 5 games. This entry was posted in MLB and tagged Baseball, Fidel Castro, Marlins, Miami, MLB, Ozzie Guillen. Bookmark the permalink.